Edition 25. Signed, titled and numbered 12/25 in pencil. Image size 9 13/16 x 6 1/8 inches (249 x 154 mm); sheet size 12 1/2 x 8 1/2 inches (318 x 216 mm). A superb, atmospheric impression, on cream Japan, with full margins (1 to 1 5/8 inches), in excellent condition. 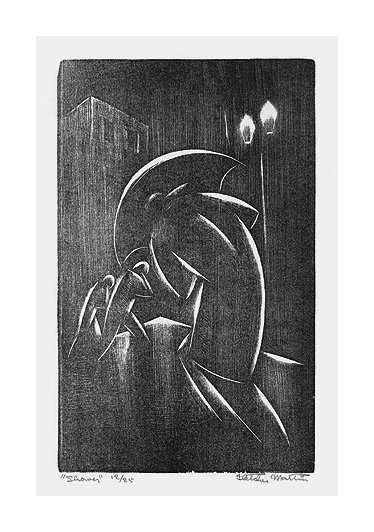 Illustrated in Los Angeles Prints, 1883-1980, Los Angeles County Museum of Art, 1980. Collections: LACMA, LC purchase, Hubbard Fund. 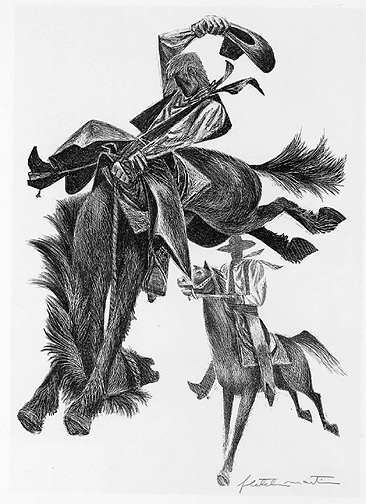 High, Wide and Handsome- - 1953, Lithograph. Image size 12 3/4 x 8 3/4 inches (325 x 222 mm); sheet size 16 x 12 inches (406 x 305 mm). A fine impression, on cream wove paper, with full margins (1 1/2 to 1 3/4 inches). Original paper tape hinge remains on the top sheet edge, recto. Pale light toning within a previous mat opening, otherwise in excellent condition. Illustrated in Fletcher Martin, by H. Lester Cooke, New York, Harry N. Abrams, 1977; American Prints in the Library of Congress, The John Hopkins Press, Baltimore, 1970. Collection: LC purchase, Pennell Fund. 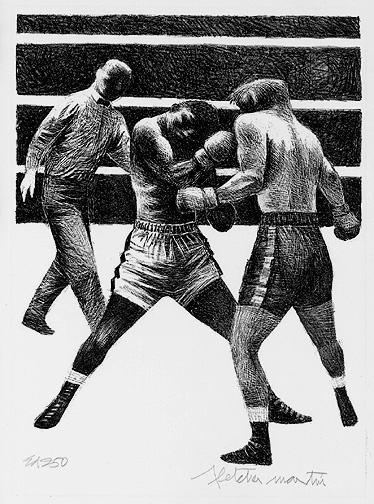 Toe to Toe- - 1965, Lithograph. Edition 250. Signed and annotated Ed. 250 in pencil. Image size 12 1/2 x 9 1/2 inches (318 x 241 mm); sheet size 17 7/8 x 13 inches (454 x 330 mm). A fine, rich impression, on off-white wove paper, with full margins (1 3/4 to 3 1/4 inches), in excellent condition.